Well it’s finally here, the latest codex to come from GW and it is one I have been waiting for. I know I’ve been quiet on the blog site for a number of months, and this I plan to change in 2014. 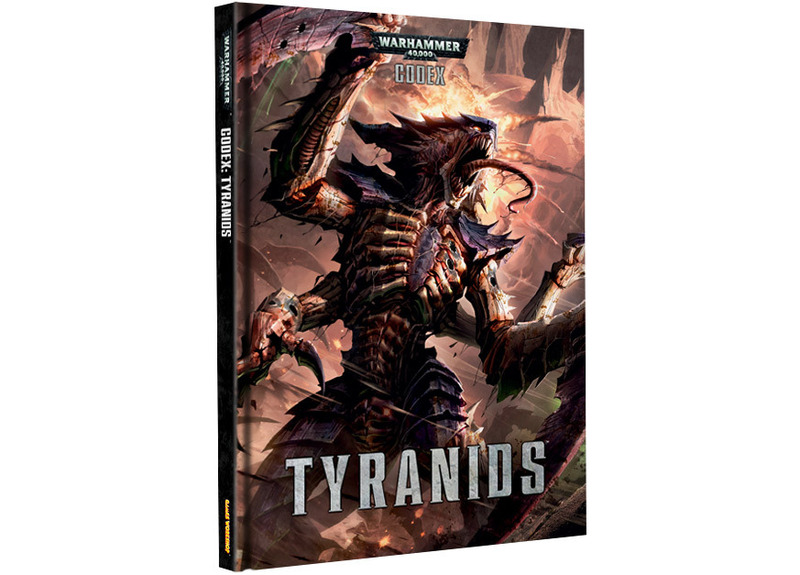 So to start off with I thought I’d go through the new Tyranid Codex, give you the updates and my thoughts on it. So here we go! First Impressions: It follows the format of the other recent additions to both 40K and Fnatasy in that it is full colour and hardback, with lots of nice artwork, some of it new (before you ask I bought the regular edition not the limited one that costs twice the price – I may like ‘nids but I like my bank balance to be health too). The Army: The army’s special rules are what you’d expect; Synapse Creature is its usual 12″ Fearless bubble (contrary to some rumors it does not give the creature Eternal Warrior – even I think that would be a bad idea), Shadow in the Warp screws over enemy psykers by give them a -3 to LD and Instinctive Behaviour the same…oh wait hold on a second. BIG CHANGE! Units outside of synapse range still have to take a LD test for Instinctive Behaviour, but now there are three types; Lurk, Feed and Hunt. If you fail the test then you roll on the relevant table to get a random result for what your unit will do. This differs depending on type but generally it is 1-3 bad for you, 4-5 inconvenient as the unit loses some cohesion or 6 actually pretty good! E.g. for Feed the creatures will either; 1-3 attack each other, 4-5 move/charge towards the nearest enemy unit, 6 charge but with the Rage rule. The Warlord traits are interesting. There isn’t actually one I don’t like. You can; turn terrain into ravenous plant life, gain night vision, increase your synapse range, gain extra VP for killing characters, reduce a terrain piece’s cover save or gain Feel No Pain….hmmmm a Hive Tyrant with Feel No Pain….sorry I was just imagining my opponent’s frustration. The Army List is laid out in the same fashion as the other codices, including a Wargear List and some unique Bio-artifacts. Most of you will probably be aware of the new units; Haruspex, Exocrine and Hive Crone. What you might not know is that the Red Terror is back as a character upgrade for a Ravener brood. What you may also not know is that there is stuff missing. The Mycetic Spores are gone (so no more drop pods for ‘Nids), which is something that disappoints me. Although I didn’t use them that much, they were part of Tyranid Lore for a long time and it seems a shame to get rid of them. The more cynical side of me would think that this is because drop pods are a ‘Space Marine thing’….but oh well. What’s also missing are the Ymgarl Genestealers, the Parasite of Mortrex and to the delight of people who’ve fought tournaments against ‘Nid players the Doom of Malan’tai. That’s right, Doom is no longer in the Tyranid army. Personally I’m not that bothered, I only used a couple of once (once for a laugh, and again to teach a young-blood a lesson about gaming), but I know that others use him as their game winner – drop Doom into the middle of the enemy and watch him devour their souls. Leads for a rather repetitive game, and one in which your opponent can do little to counter. Maybe they should have re-written him, but no sense in crying over spilt ichor. HQs: In an interesting move Old One Eye and Deathleaper have moved to HQ section. This means you can have a general without it being a Synapse Creature. They’ve also dropped in points. You’ll also find the Hive Tyrant, Tervigon, Tyranid Prime and Swarmlord still present with a few subtle changes but nothing too extravagant (the Tyrant is now BS 4 for example). Both the Tervigon and the Tyranid Prime have had a large points increase (+35 and +45 respectively) but their rules & stats are virtually the same. Despite the cost of the box set it’s good to see GW finally making a model for the Prime. In a similar vein it’s also good to see a plastic box for the Tyrant Guard/Hive Guard, and considering these models were metal/finecast the cost for 3 is about the same. Plus you finally have all of the weapons options for move them and the Warriors. Your generic ‘characters’ have access to the a wide range of bioweapons and biomorphs, plus the bio-artifacts. Troops: No real changes here. Termagants & Hormagaunts have dropped 1pt, rippers are up 3pts. Warriors & Geenstealers are the same, though the Warriors now have access to Flesh Hooks, which work similar to assault grenades in combat again. The Termagants still have the weapon options for spike rifles, spinefists & devourers, and for some point the strangleweb. 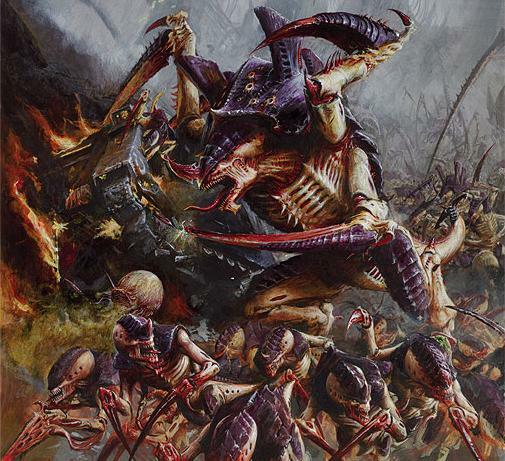 Having played Tyranids since 2nd Edition I was happy to see the return of the old weapons…but I don’t see why anyone would take the strangleweb. Sure it’s a template weapon, but it’s Strength 2 which means at best 5’s to wound…you can only have 1 for ever 10 Termagants and it costs 5 points, that’s more than the gaunt carrying it. Like I said, don’t see the point in a Strength 2 template. Elites: Here’s where it starts to get interesting. The Hive Guard now have the option for upgrading to the Shockcannon, and 18″ range haywire weapon, just to increase their vehicle killing potential. I’m a little disappointed that they didn’t get an anti-aircraft weapon as an option, given the dominance of aircraft in current 40K, they would have seemed the logical unit to give it too. As it happens there is no ground based AA gun for the ‘Nids. Lictors seem to be useful again. They can’t assault from Deep Strike, but they no longer have to deploy in that way. They can deployed like a regular unit and come with the Infiltrate special rule, so they get to start the game on the table and act as a teleport homer for your other units. This also means you don’t have the “Surprise I was that tree! Now I can’t do anything for a turn so feel free to shoot me”. If you do decide to Deep Strike them, they don’t scatter. They’re also slightly better in combat than they used to be. Zoanthropes are now a Brotherhood of Psykers, but with a Mastery Level of 2 and can have 2 psychic powers (one of which is Warp Blast). Venomthropes; just some clarification of the Spore Cloud (Shrouded) and Toxic Miasma is now a ‘one use only’ toxic fart. Pyrovores are worth taking as a close support creature now that they have 3 Wounds and 2 Attacks as well as the heavy flamer on their back. The Haruspex is the new kid; 5 Wounds, 3+ save monster with acid blood and the ability to consume an entire chain of fast-food restaurants. His only ranged weapon (grasping tongue) is a 12″ range, S6 AP2 attack that gets a Precision shot on a 6. When it kills stuff it regains lost wounds and in close combat it just rampages along with any wounds it causes granting it extra attacks. Fast Attack: Shrikes, Raveners, Sky-slashers, Gargoyles and Spore Mines as expected. Though now Spore Mine Clusters just Deep Strike as normal into the game. This does give you an interesting option to use the Lictor’s homing ability to stop the mines from scattering. Also they don’t explode as multiple blasts anymore. When a Spore Mine Cluster (including those from Biovores) goes off you get one large blast at Strength 4 with the Strength increasing +1 for each additional Spore in that cluster. 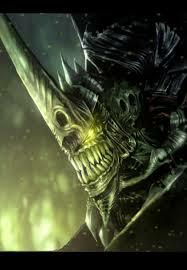 S9 AP4 large blast guided by a Lictor anyone? As mentioned the Red Terror is back as a character upgrade to a unit of Raveners. It’s basically a slightly larger, tougher Ravener with the ability to swallow anything smaller than a dreadnought. Seriously, if it hits with 4 or more of its Attacks (it’s WS6 and will have 6A on a charge) then it can choose to swallow an Infantry, Jump or Jet Pack Infantry that isn’t very or extremely bulky. The model gets an Invulnerable save (if it has one), if not, dead regardless of wounds or toughness. The Harpy has had a bit of an overhaul. Its points cost has gone down and it has gained a Wound and an Attack. Both it and the Hive Crone are both S5 T5 with a 4+ save, making them the weakest of the monsters, but as they’re flying you should really only have to worry about AA guns. The Harpy is still an all-gun beast designed for ground attack (infantry or vehicles depending on your weapon choices) that can poop spore mines. It can now poop spores every turn though. It’s also good to see that they’ve finally done the model for it. The Hive Crone is the Tyranid’s only real AA weapon. And it should do a decent job of it too. When vector striking it counts as S8, and although its drool cannon (yes they really called it that) is a ground attack weapon, the 4 tentaclid missile-like creatures are 36″ ranged haywire shots that can re-roll your misses against aircraft and flying monsters. Add to that the fact that flying monsters have a 360* fire arc and you’ve got something that can shoot down an enemy fighter even if it is behind it. Heavy Support: YAY!!!!!! The Carnifex is worth taking again!!!!!!!!! My main gripe at the last codex was that it castrated the Carnifex. The fex itself wasn’t that bad, but for the points you were paying the other monsters would do a better job. Well now it’s 120pts instead of 160. It has a wider range of upgrades (including tail weapons), an increased Initiative, can come in units of up to 3 and causes D3 Hammer of Wrath hits instead of 1. Nice to see you back old friend. Biovores & Exocrines form the artillery. Spore mines I’ve already mentioned (though for some reason Biovores now have 3 wounds and 2 attacks), but the Exocrine has a very nasty weapon. It’s the same size as the Haruspex and its gun i relatively short ranged for a big gun (24″). It is however S7 Ap2 and has a large blast so terminators watchout! The Tyrannofex (the other gun beast) has had a massive points drop; from 250 to 175! I wasn’t expecting that, especially a drop of so much. It is the same beast though, right down to its wonderful S10 gun that can blow up a land raider but for some reason can’t kill the marine next to it (its AP4 – seriously a long ranged S10 anti-tank gun that is AP4…go figure). 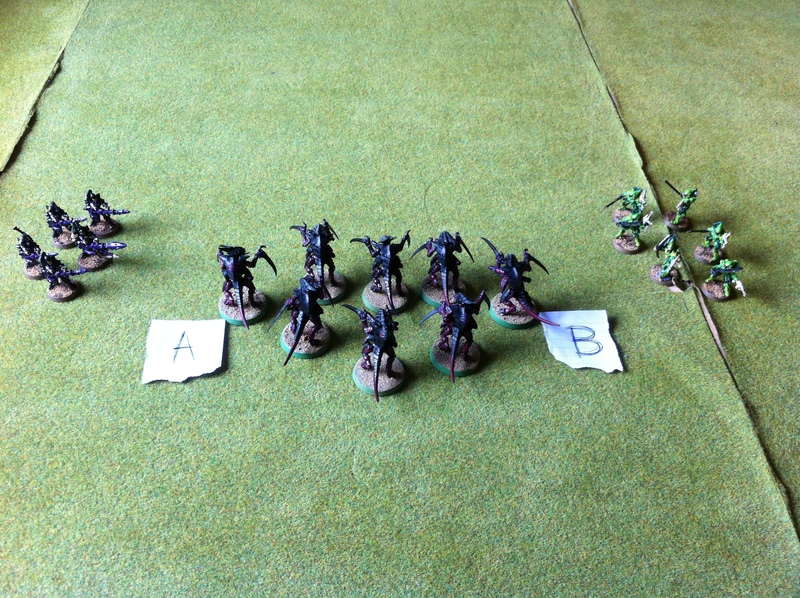 The Trygon and Trygon Prime are praically the same, just a 10pts drop but the Mawloc’s gone down 30 points. Its Burrow is similar (though it can’t do it on the first turn anymore) and its Terror from the Deep rule is similar (S6, AP2, large blast). But this time if there is enough stuff left on the spot where the Mawloc comes up, it gets to do it a second time! There is a risk though, that if after the second time there still isn’t enough room to place the model then you must roll of the Deep Strike Mishap table. And thats it for your units. Other Stuff: Most of the weapons & biomorphs have only had subtle changes to bring them into line with the current edition. Boneswords for example are AP3, lash whips no longer knock your opponents Initiative down to 1, but instead give you +3I, that sort of thing. Crushing claws gives you armourbane and unwieldy. Venom Cannons no longer suffer a negative penalty against vehicles, the first time ever! There are 3 ranged haywire weapons which I think is interesting. Most of the Tyranid Shooting though is still characteristic; short ranged but devastating. As for the other biomorphs you have a choice of 4 tail weapons to go on your monsters, which is nice. They all grant you an extra attack of some sort. For me the biggest change is the absence of the 2+ save. That’s right no 2+ for anything (except the Tyrannofex). It’s just not an option. What is also interesting is Regeneration. I was expecting it to grant the creature the It Will Not Die rule (at the end of your turn you regain a wound on a 5+) instead you get it on a 4+. So at the end of your turn there’s a 50/50 chance that your model will regain a wound. Nice, but not sure if it compensates for the lack of 2+ saves…we’ll have to see. The Bio-artifacts are unique items, but nothing overly special or unbalanced. Slightly more powerful bonesword, extended synapse range, that sort of thing. One of the big changes is that your psykers can only use the Hive Mind powers, none of the ones in the 40K rulebook. It does mean that there is the chance that your Hive Tyrant will gain warp blast. All your favourites are there; Dominion, Catalyst, The Horror, Onslaught, Parosysm, Psychic Scream and Warp Blast, doing much the same that always have. Well that’s my 2000 word look at the new Tyranids. Do I like them? Daft question really, they’re still my favourite army. Changes I’m glad to see; Lictors, Pyrovores & Carnifexes are worth taking, the return of the Red Terror, plus some new monsters to play with. Changes I’m not sure about; the loss of the Mycetic Spore. Stuff I would have liked to have seen; a ground based AA gun option for the Hive Guard and a Strangleweb with a higher strength. Overall a lot to look forward to with the new Tyranids. I’ll let you know how they play at a later date. Now which world should I devour first..? On Sunday I joined my local wargaming club for one last round of 5th Edition 40k. 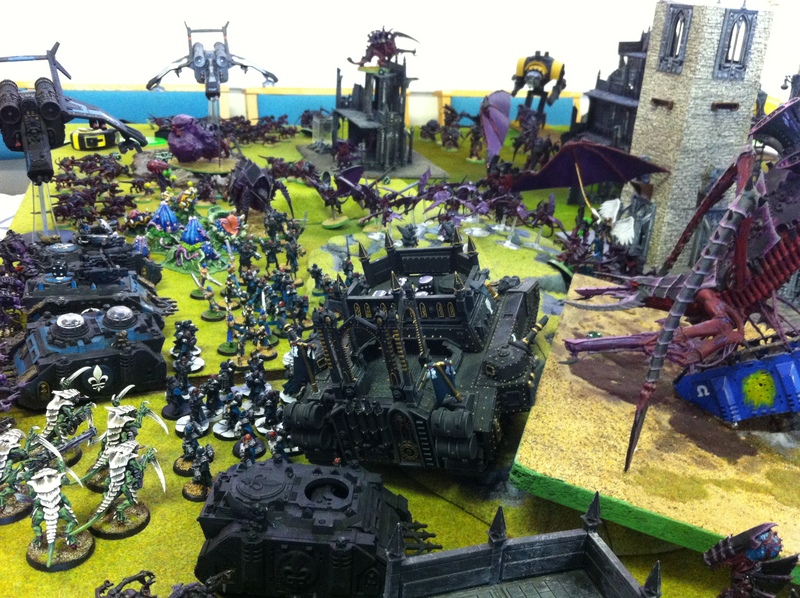 They had arranged 3 separate Apocalypse games for those who have had enough disposable income over the years to assemble large armies; Imperial vs Orks, Imperial vs Chaos and Imperial vs Tyranid. 3 guesses which game I was playing in. One of the criticisms leveled at Apocalypse is that it’s a game of “who brings the most wins”. Well the games that the club run are a little more organised than that. In the game I played there were 2 Tyranid players (myself and an ally) and on the opposing Imperial team 4 players with a mixture of Imperial Guard, Marines and Sisters of Battle. Despite the unevenness in players, both sides had between 18,000-20,000 points (it does get hard to tell in games that are that BIG). Amongst the usual squads of troops and the endless hoards of Termagants there was also 3 Paladin Titans, 2 Hierophant titans (Fluffy had a friend! – Fluffy is the name of my Bio-titan in case you were wondering), a number of Baneblades and their several variants, and who knows how many other types of tanks. There was also a massage mobile fortress/land ship thing that someone had made. I didn’t get a picture of it but it was about 20″ long, 12″ wide and sported one hell of a demolisher type cannon. The organizers of the event have designated that each side had 30 minutes per turn. Because all the people on our table are veterans of more than one Apocalypse game (and were of a sensible disposition) we were allowed to monitor our own times. The organizers had set objectives for each side; in our case we designated one HQ (my main Tyrant) as the key Hive Node that we had to protect, we also had to protect 2 bio-stores in our deployment zone and we wound gain one objective point for every 30 enemy killed. We found out that our opponents had to capture two downed Rhinos that had data nodes, kill our Hive Node and hold the line. The game was one of the most fun games I have ever had the pleasure of playing. There were mass explosions everywhere. Fluffy had a fantastic time; he blow off the turret of a Baneblade, downed a few Lemon Russ’, took out a Stormwind, and the best was when 6 Penitent Engines appeared in our rear and charged him. He had a wonderful game of ‘whack-a-mole’ as 4 were down in a matter of seconds whilst the other 2 were damaged. Almost the entirety of the Sister’s army deployed in our rear and managed to cut down a load of gaunts and finished off the Hive Node – points to them. The ‘barrage balloon’ spore mines took out 3 Valkyries and a pair of Carnifexes took down a Paladin Titan. There were battle cannon explosions and Warriors & Gaunts dying everywhere. 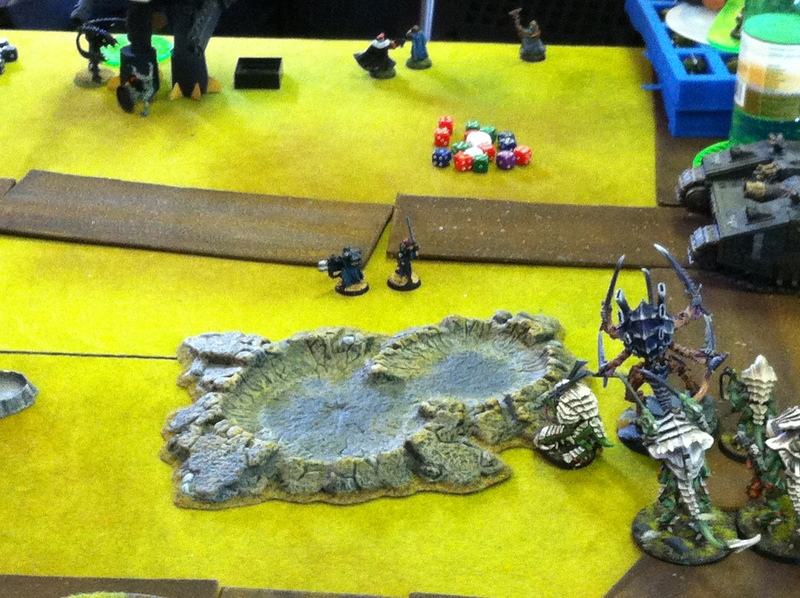 Both my Trygon & Mawloc were shot to pieces after deep striking into the heart of the enemy. There were Genestealers taking down Baneblades and Exorcists whilst a lucky Ravener survived being stomped on by a titan. The two bio-titans advanced as one whilst the Swarmlord formed a Living Fortress (that’s an Apocalypse formation consisting of at least 3 Tyrants and 5 Tyrant Guard). With this mass having no trouble cutting up the Imperial centre, Fluffy turned around to deal with the Sisters as the last of my reinforcements came crashing in (Wing Tyrant, Gargoyles and plenty more Genestealers). The game climaxed with the Swarmlord’s unit hitting that big landship and ripping it open. The thing suffered a cataclysmic explosion and its engine core went nuclear!!!! As the mushroom cloud lifted all that was left within 2 feet was what you see below. It killed Tyrant Guard, tanks, Marines, Lictors, Genestealers…pretty much everything within 24″ except the Swarmlord, a Paladin titan and for some reason 2 Sisters who must have had the Emperor with them as they walked out of the blast. At this point we ran out of time and called the game. It had been 4 turns of fun and at the end a Tyranid victory had been attained – we’d managed to kill more than enough Imperials and had certainly crossed their lines. As for the other two games going on; Orks beat Imperials and Imperials beat Chaos. As the mushroom cloud cleared and the fallout began we all agreed that that game had been one of the best any of us had ever played and that the climatic nuclear explosion was a fitting end for 5th Edition.